Well, it was bound to happen. After ten years of crazy stories and silly monologues, Craig Ferguson will be stepping down as host of CBS’ The Late Late Show once his contract expires at the end of December. He made his announcement to the audience at Monday’s taping, making sure to tell everyone that it was his choice to leave, and not CBS’. And I don’t think anyone would call him a liar on that front. After David Letterman announced at the beginning of the month that he would retire from late night in 2015, Ferguson was thought to be a front runner for the job. Having held down the fort on The Late Late Show after Craig Kilborn left in 2005, Ferguson brought in millions of new fans with his balance of subdued chaos and an abundantly warm personality. Yet CBS looked right past him and gave the Late Night job to Comedy Central faux pundit Steven Colbert, and the rumors immediately started swirling about what Ferguson’s plans for the future would entail. And now we know, via Variety. “CBS and I are not getting divorced,” Ferguson told his audience, “we are consciously uncoupling. 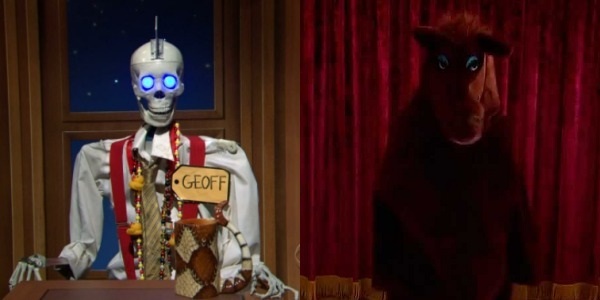 But we will still spend holidays together and share custody of the fake horse and robot skeleton, both of whom we love very much.” It does seem like a crime against non-humanity that the name tag-wearing Geoff and the stuffed horse Secretariat will be gone from our TV screens possibly forever. You can watch part of his announcement in the video below. No hankies necessary, but we won’t judge. The late night lineup has changed a little too much in the recent past for my tastes, and now that Craig is leaving, it means Carson Daly is the resident champion of sticking around like a sore thumb. CBS executives are no doubt already thinking about whom they could find to fill Ferguson’s seat, and chances are they’ll be passing an eye on the same talent pool that Comedy Central is looking through to fill Colbert’s timeslot. The silver lining here is we still get another seven months of Craig Ferguson, and that ain’t half bad. Are you guys sad to see the Scottish comedian vacate late night? Let us know in the comments.